Oh So Bright: Christmas Miracle! I think most of you heard that Houston had snow this past Friday. I mean it did make national news and all! It actually did come down pretty heavy for a few hours and it was beautiful. The snow was perfect because you could make snow balls or snowmen with it. Of course my camera decided to die the one day Houston gets snow. So all these pictures are will my camera phone. It just doesn't give the snow justice! Best of all, Ryan & I's work let us out at noon so we had the rest of the day to play. We ate lunch in about 30 minutes and our car was already covered. I LOVE snow covered houses. This totally helped me get into the Christmas spirit. Unfortunately, the snow was gone within just a few hours. But it was fun while it lasted! I'm attaching this preview of a movie that made my family and I crack up at Thanksgiving. Plus it's the reason for the title of the blog. 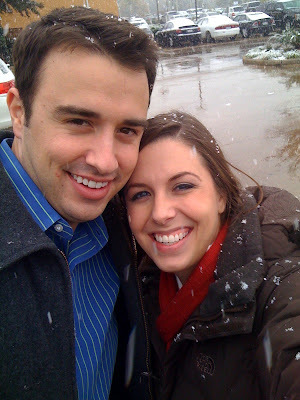 Well, that and the fact that we had snow in Houston! I was SO excited it snowed too!! Here in CS we did not get as much as Houston but I was still happy!!! I wished it would have last longer, but am happy that it was still on the ground the next morning! 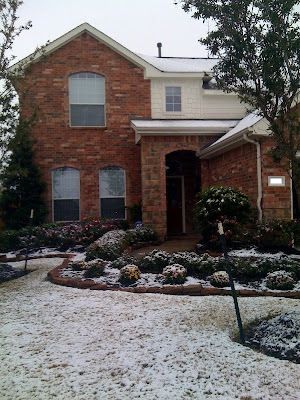 Oh wow it snowed alot near Katy because it didn't even really stick to the ground over in Conroe. 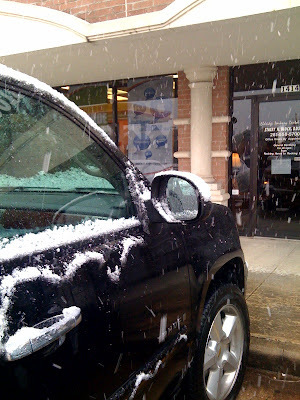 It did cover the cars though which was fun to go and scoop it up and throw around. We got released at noon too it was so nice because everyone was out of school and work so we had a "snow day" for not even an inch of snowfall haha. Our family in new york was dieing laughing at us making such a big deal over this but to us it's a once in a lifetime:) That's funny my camera wasn't working good either that day so I only have a couple of pictures on my cell too. i am dreading the snow here in minnesota, that's just me though ;) i live in the wrong state. the picture of you two is super cute!! you guys got some good snow over there!! We didn't get nearly that much!! Love that first pic of you and your hubby! OH MY GOSH I can't believe you guys got half a day off of work just because of some snow! Wow. That's all I can say is Wow. The pic with Ryan and you is really cute.